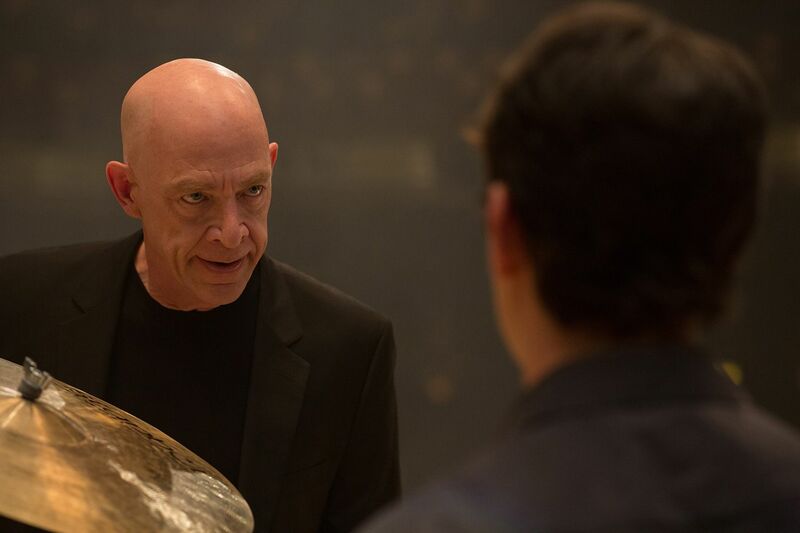 Reduced to the most basic possible logline plot description, Whiplash might sound like an impossibly cheesy inspirational teaching drama with jazz band setting. Thankfully anything resembling warm, fuzzy, and safe entertainment ends there in writer/director Damien Chazelle’s debut feature. What he’s created is a vicious game of psychological warfare between a talented pupil and nearly psychotic teacher that ducks and swerves against convention at every possible turn, transforming into a fascinatingly dark character study quite unlike anything that could be expected from this subgenre. Want to know why? Then go ahead and hit that jump. 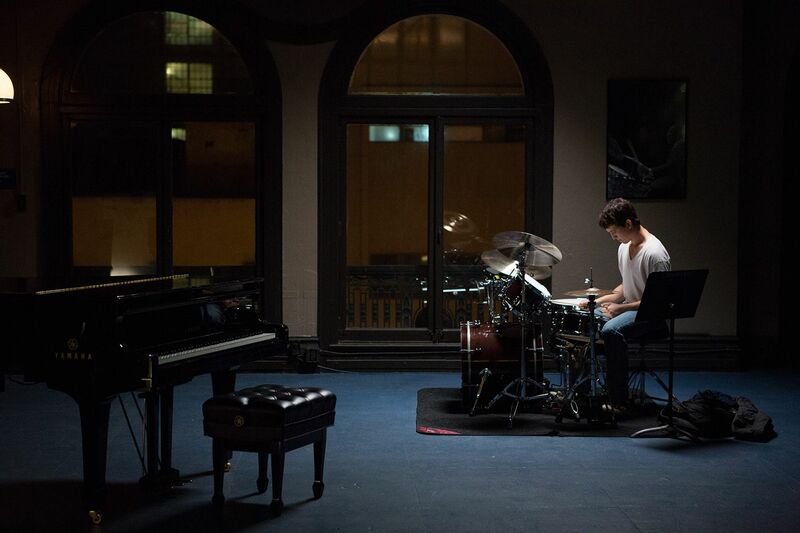 Miles Teller stars as an incredibly gifted and unhealthily driven young drummer tearing up his skins (both of the drum and flesh variety) at a prestigious New York music academy. 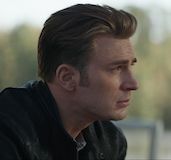 When he’s selected by a feared teacher played by JK Simmons to join the school’s beloved jazz band, Teller is initially thrilled and can’t believe his luck. The time has finally come for his talent to be discovered and all of those clichés. Unfortunately, Teller doesn’t realize that the reason for Simmons’ intimidating reputation is that his teaching style is pitched somewhere between a drill sergeant and a schoolyard bully. Simmons believes that niceties and encouragement simply aren’t enough to inspire the passion necessary to become a great musician. Nope, in his fractured mind, the only way to encourage success is through intense psychological abuse and mockery that will encourage perfectionism out of fear. In Teller, he finds a pupil just obsessive enough to take the challenge and fight back, leading to an unrelenting game of psychological warfare between the two characters that takes the film into dark and unexpected places. One of the best aspects of Chazelle’s searing script is how he is able to nimbly avoid convention. There are no tearful make-up scenes or inspiring lessons spelled out here. In fact, the lone scene that seems to suggest such catharsis might take place is merely a brilliant misdirection. The only weakness his script and film have are two loosely established and somewhat lost subplots involving Teller’s brief and fragile attempt to pursue a girl (Melissa Benoist, whose character is pretty well summed up as “the girl”) as well as his sweet relationship with his kindhearted father (Paul Reiser). Both are interesting threads before they are unceremoniously abandoned. However, that’s easily forgivable because it’s almost the point. The film is about two men driven and damaged by obsession who focus it entirely on each other and the way that the rest of Teller’s life slips away feels entirely appropriate. More than anything else, Whiplash is a two-handed battle between Teller and Simmons with neither performer backing down and both arguably delivering arguably the finest performances of their careers. 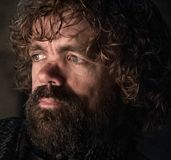 Robbed of his usual wise-cracking crutch, Teller dives headfirst into a disturbingly focused character who shuts out all people, comfort, and emotion in pursuit of ambition. 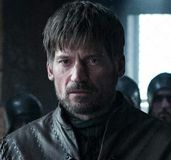 At times it’s deeply uncomfortable to watch his intense struggle, yet Teller still manages to find audience empathy if only because of his sparring partner. JK Simmons rages onto a screen as a monster the likes of which he hasn’t played since OZ. Violent, sporadic, and always packing a mouth full of vicious vitriol, it’s an astoundingly harsh performance. Yet as with Teller, Simmons adds layers beyond the screaming exterior. It’s clear the rage comes from passion and on some level he at least cares enough about his students to want to push them to success, even if he dare not show it. Together, Teller and Simmons make for thrilling sparring partners whose frequent face offs provide as much sweaty-palmed drama as a thousands thrillers. Of course, the setting and subject of the film is music. It’s there and always exquisitely performed. Yet, on a certain level it’s almost incidental. 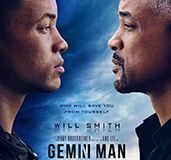 This is a film about two damaged souls raging against each other in the hopes of achieving greatness together. What they battle over as teacher/student could have been anything. 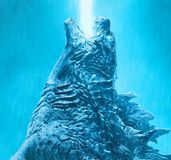 Music works well because it seems like such an innocent subject for this much bile to be spilled over, yet that’s not really the point of the movie. Nope, Chazelle serves everything up purely to watch his protagonists battle and torture each other with little hope for conventional catharsis. 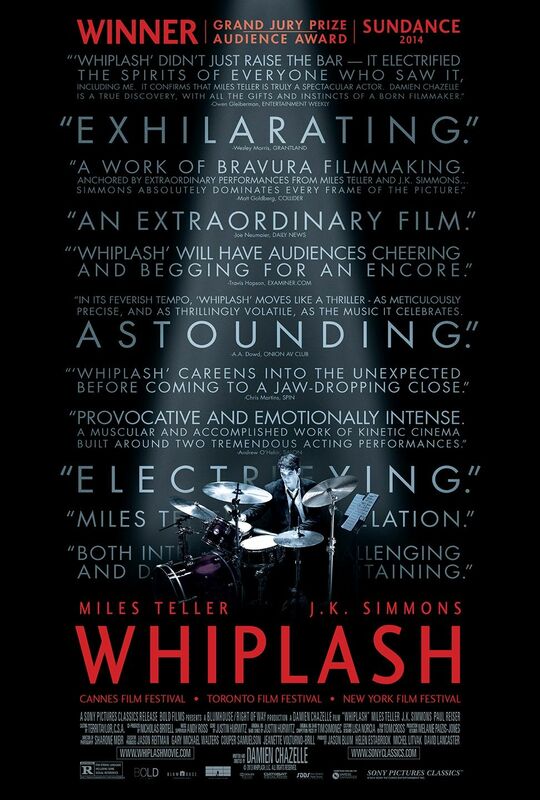 Whiplash an incredibly impressive debut feature from a filmmaker who should go far and an extraordinary showcase for two actors who just might have pushed themselves to their personal limits in the best possible sense.